As a reward for completing National Novel Writing Month 2014 successfully, I purchased one of the many novel-writing and fiction-writing software packages that had been on my radar. Ingermanson Communications' Snowflake Pro is one of those. If you're thinking about purchasing it, too, it is my hope that this post will help you make the call one way or the other. 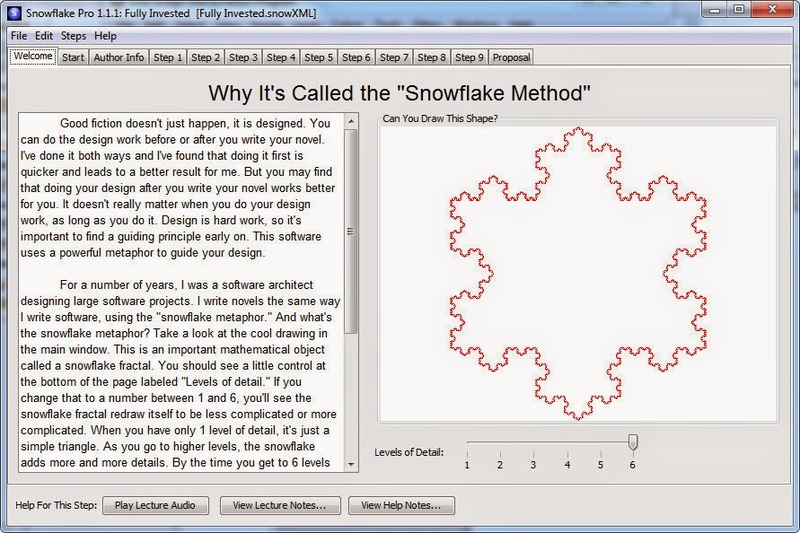 Randy Ingermanson is the creator of the "Snowflake Method" for writing a novel. We talked about that the other day. In a nutshell, you start by defining your novel in a single sentence. Then you expand that to a paragraph, and finally to a page. From there, you flesh out your characters and begin brainstorming the scenes you'll need to tell your story. At that point, you should be ready to write. Snowflake Pro guides you through Ingermanson's method from start to finish. It doesn't force a particular structure or story design on you, but tries to help you flesh out the story using whatever structure works for that story. 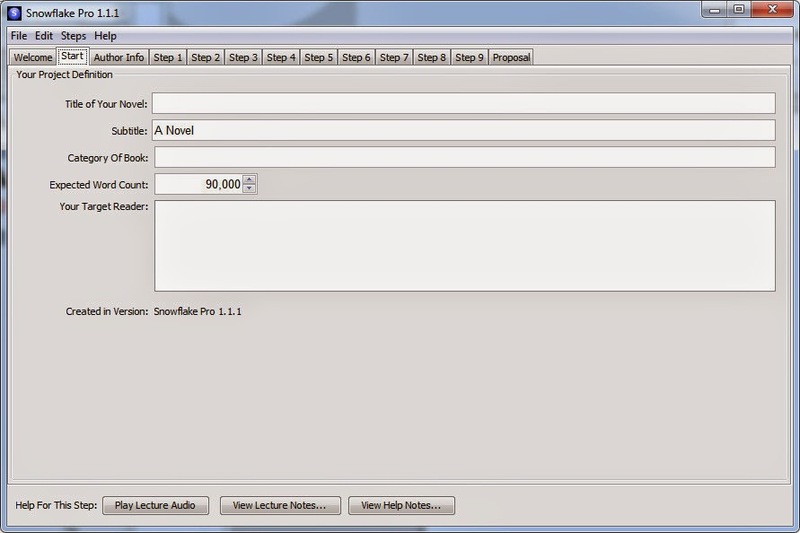 You won't write your novel in Snowflake Pro. It's not a word processor. Ingermanson describes it as a "design tool" which is an apt description. It helps you design the story, but the structure and writing are all up to you. 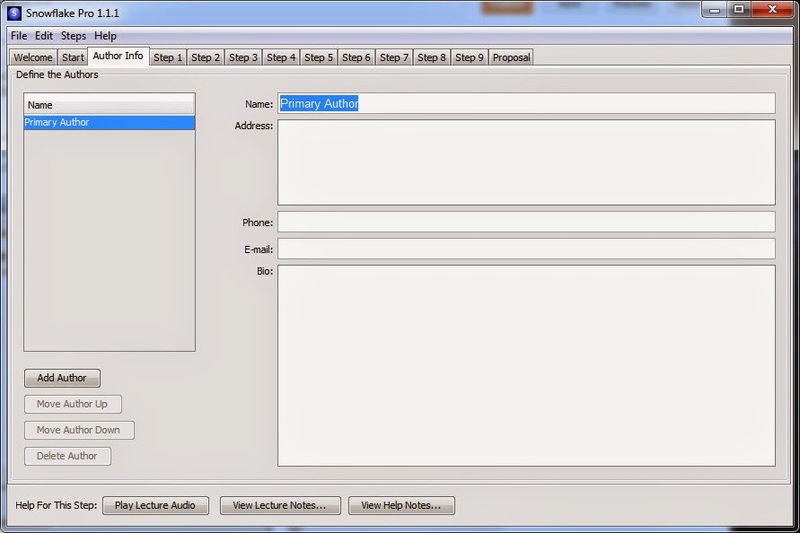 You can buy Snowflake Pro directly from the developer's web site. List price for the software is $100, but if you have purchased the Randy Ingermanson's Writing Fiction for Dummies book from Amazon or another retailer, you can get 50% off (making the software $50). Compared to some of the other writing tools on the Internet, that's cheaper than some and more expensive than others. Once you purchase the software, you'll download it from the author's web site. Versions are available for Windows, Macintosh, and Linux. This post will focus on the Windows version, which is what I use. You'll install the software on your computer, launch it, and start using it. 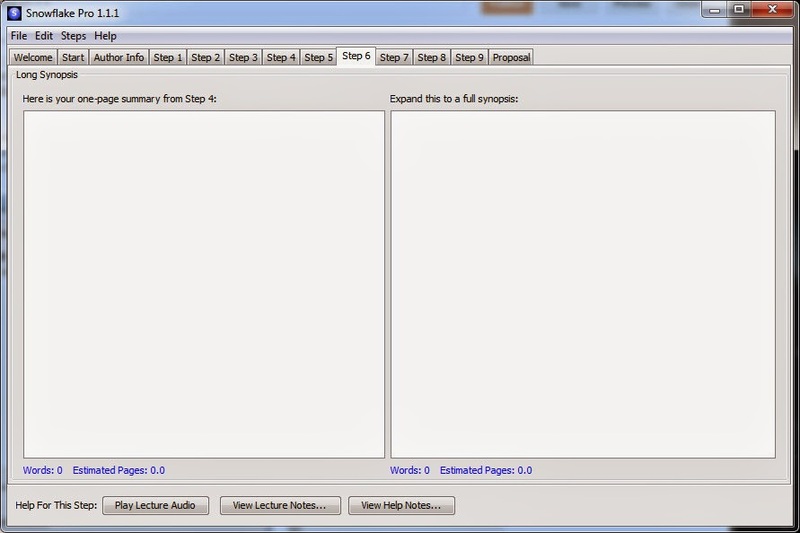 When you're ready to begin, you click the Start tab near the upper-left corner of the window. 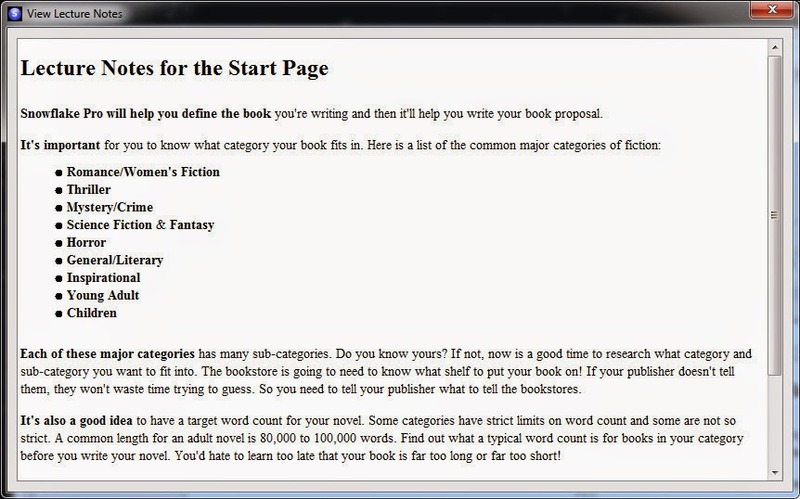 Here, you'll provide information about your novel - its title, subtitle, category, expected word count, and target reader. If you need help with these things, clicking the "Play Lecture Audio" button will play a recording of Ingermanson himself telling you what belongs in the various fields. 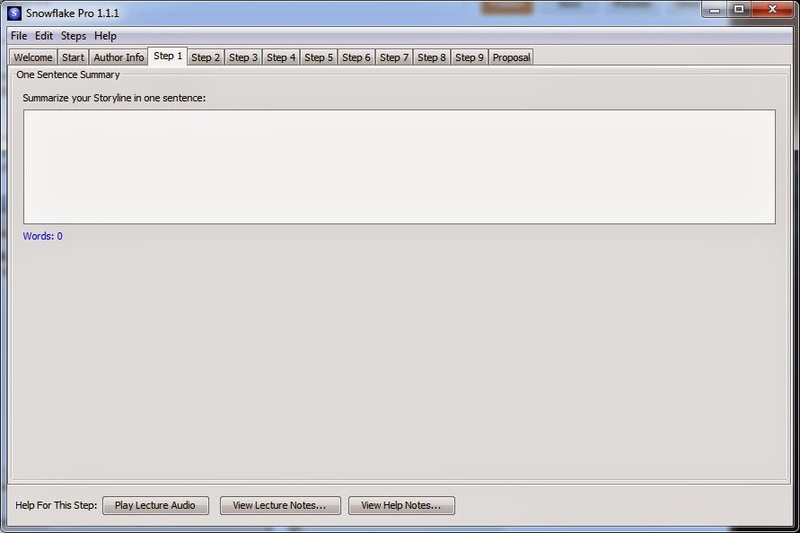 This audio is available for each step in the process. 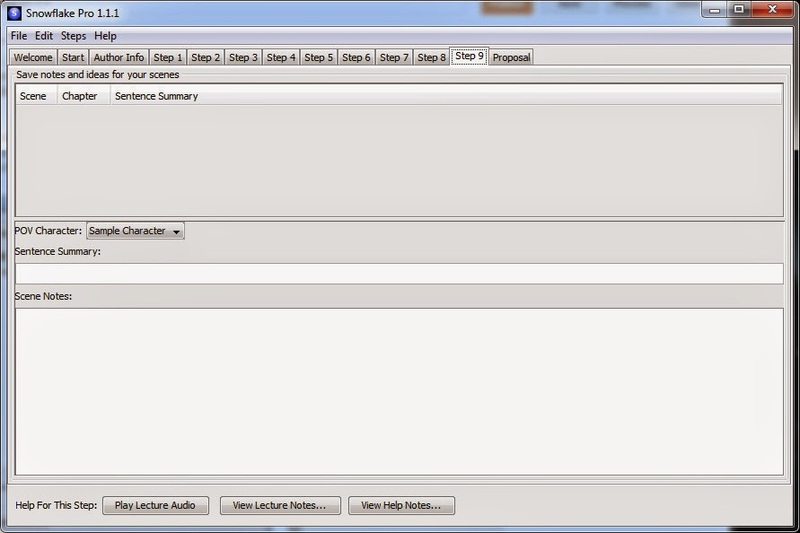 You can also click the "View Lecture Notes" if you prefer to read rather than listen. 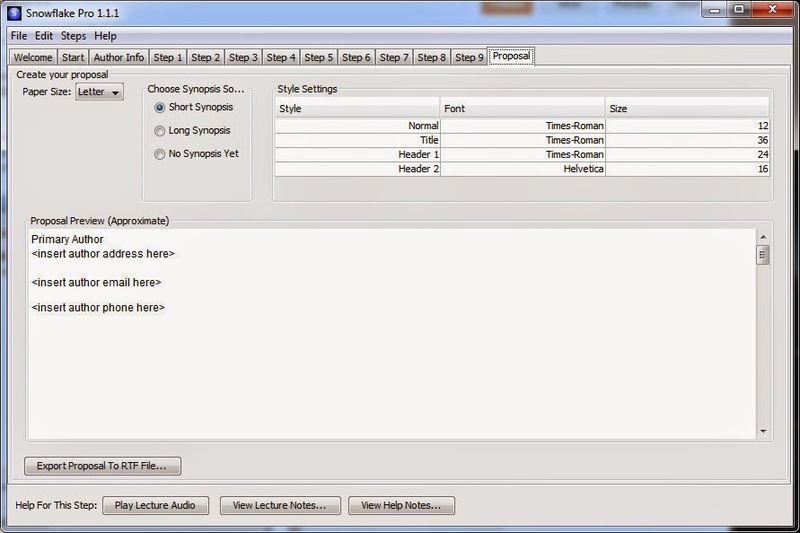 The Lecture Notes are a written version of the audio in most cases. Ingermanson includes sample Snowflake files for the first Harry Potter book, Gone with the Wind, Pirates of the Caribbean, and Pride and Prejudice. If all this isn't enough help for you, there's also a Help menu in the product with links to the product support page, frequently asked questions, feature requests, bug reports, and more. Next, you'll input your Author Information for the story. With this out of the way, you're ready to start the actual Snowflake process. The Snowflake Method starts with describing your story in a single sentence, preferably one of fifteen lines or less. Ingermanson recommends looking at the descriptions of the novels on the New York Times Bestseller List for examples. The point of crafting this one-liner is to focus in on the most important elements of your story. This is your "elevator pitch" for the novel you're about to write. With this summary "skeleton" created, you're ready to start fleshing out the next level of detail. In this step, you take that one-sentence summary and turn it into a one-paragraph summary. This adds a bit of detail to what you've already done. Ingermanson recommends taking an hour or so to do this step. Show set up the story, describe the major disasters, and the ending. He refers to it as "three disasters plus an ending" in the audio. With your storyline summarized, you're ready to move on. Now that you have a basic idea of your story, it's time to create the characters you'll need to properly tell the story. For each character, you want to identify their ambition, story goal, conflict, epiphany, sentence summary, and paragraph summary. The ambition is their overall life goal, like "to make the world a better place". The story goal is the thing the character is trying to accomplish in the novel. The conflict is the reason the character can't immediately have the story goal they want. The epiphany is what the character will learn, or how they will change, in the story. The Sentence Summary is a one-sentence summary of the character's story line, from their point of view. 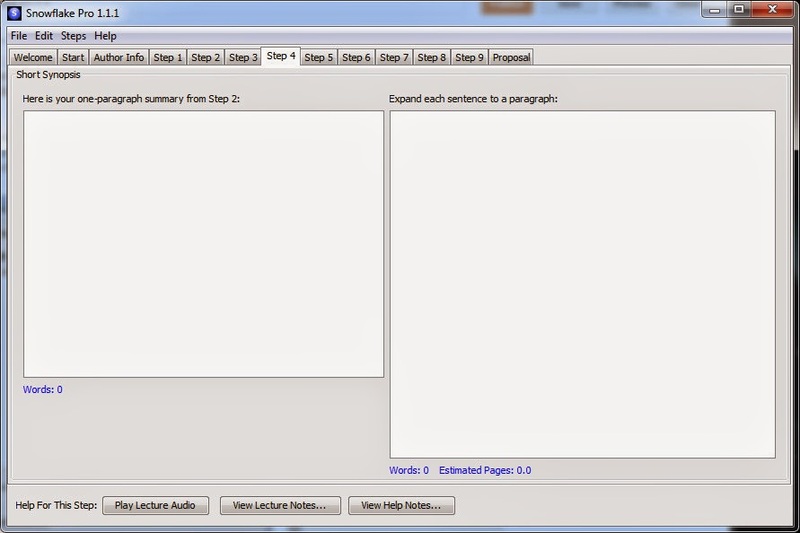 Paragraph Summary is an expanded version of that character's Sentence Summary. Once you've gone through this exercise for all your characters, it's time for the next step. By the time you've gotten to this point, you've probably got a good handle on the characters who'll be participating in the story, their motivations and goals, and have probably rewritten the one-paragraph summary you created earlier. Now, you'll expand that one-paragraph summary into a short synopsis, roughly one paragraph for each sentence in your one-paragraph summary. Now that you've expanded on the big-picture view of your story, it's time for the next level of detail. 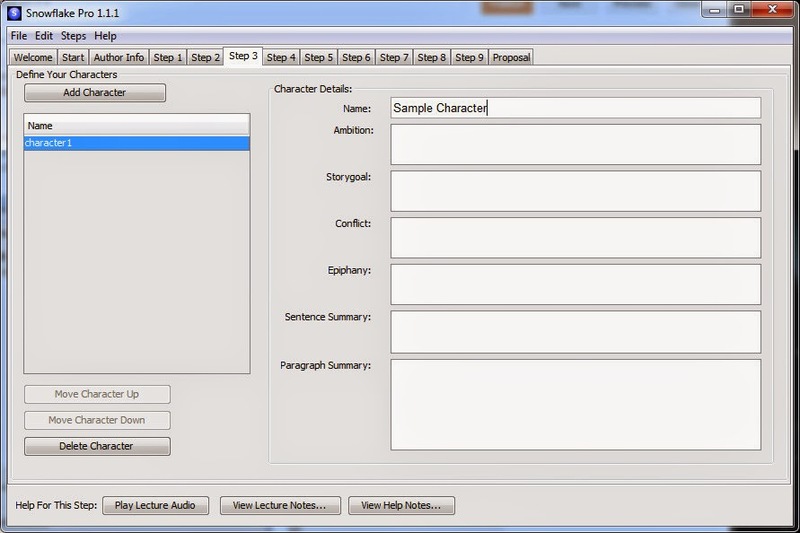 For each character, you'll now write a synopsis of the story from their point of view. This should contain anything about a character's back story, likes and dislikes, etc. This is all about thinking more about your characters. At this point, you've gotten down a lot of detail about the story and the characters. In the next step, you'll flesh things out even more. The Long Synopsis is a several-page document that should take you about a week to work out. It should expand each paragraph from the original short synopsis and expand it to a full page. This helps you start to work out details in the story, make better strategic story decisions, etc. You'll possibly be going back and modifying earlier steps as a result of what you uncover here. Now that you've detailed a lot of the story, it's time to further enhance your character detail. In this step, you're going to further develop your characters. You'll figure out their birthday, hair color, age, weight, and other information that you might later use in the story. Documenting all this here will give you a reference source as you write. Rather than getting half-way through writing the book and wondering whether your character Fred had two sisters or a brother and sister, you should find those answers here. It might take you weeks to go through all this. Next, it's time to brainstorm the scenes you need to tell your story. In this step, you'll lay out each scene you want in the story. 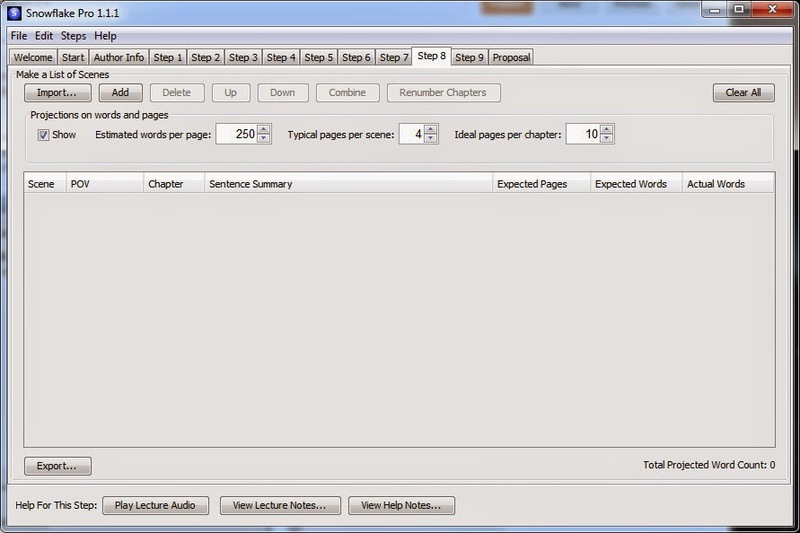 Refer to your long synopsis from Step 6 and try to break the synopsis down into scenes. 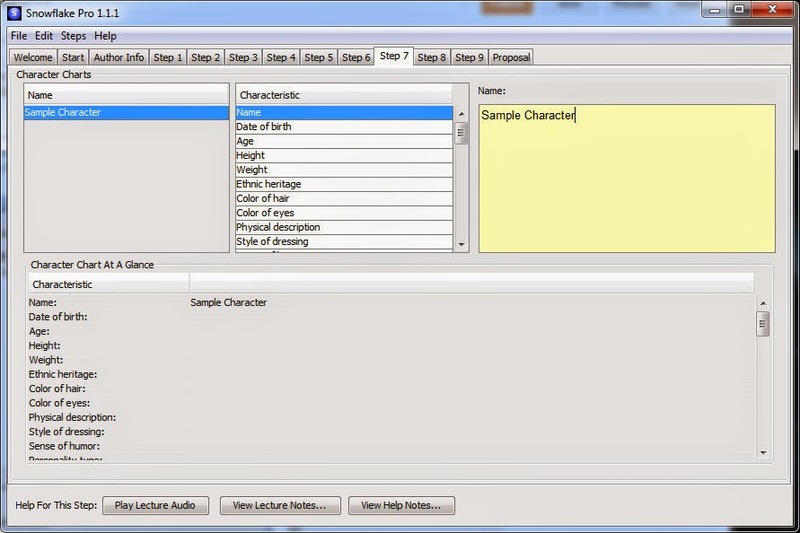 This step allows you to identify your POV character, a summary of the scene, the expected number of words or pages, and the number of actual words you wrote for that scene. Scenes can be moved up and down in the list, and new ones added. 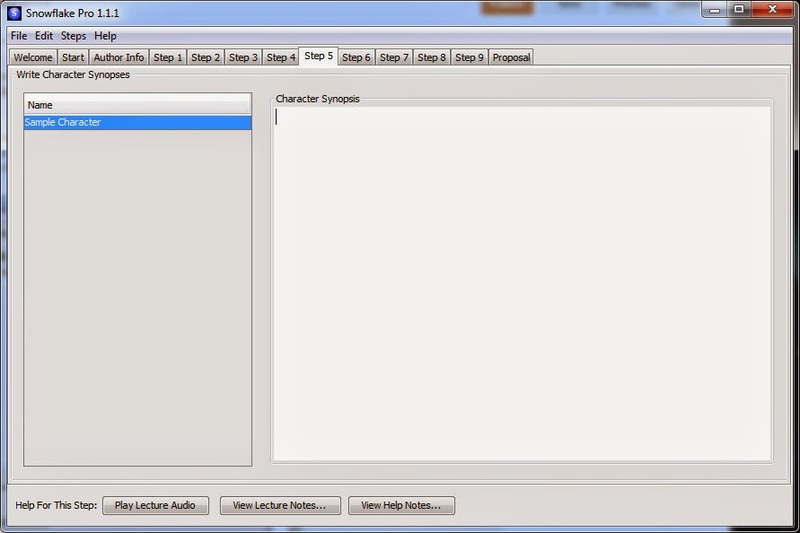 The Import button allows you to import one-per-line descriptions of scenes into Snowflake Pro. 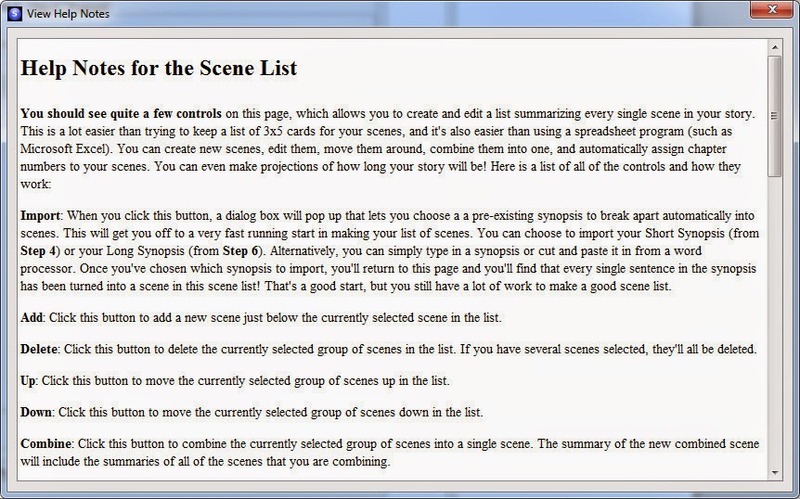 In this last step, you'll record notes and ideas for the scenes you'll want to write someday. These might be notes on setting, characters, dialogue, or anything else you want to be sure to remember about that scene. Now that you've brainstormed this novel thoroughly, it's time to look at your Proposal. This time, you'll sit down to write your proposal for the story, something you might use to get the attention of an agent or an editor at a publishing house. When you're finished polishing it up, you can export it in a Rich Text Format (RTF) file that Microsoft Word and many other word processors can support. Much of the information that goes into the earlier steps gets automatically carried over into this one to make it easier for you. And that's pretty much it. You've brainstormed your story, characters, and scenes. You should have a good long synopsis of what's going to happen, which serves as the roadmap for your writing efforts. If you're thinking about buying Snowflake Pro, you're probably asking yourself if it's worth the $50-100 Ingermanson is charging for it. You're wondering if it will help make your stories better. The answer to all those questions is a definite... maybe. If you wanted to take the Snowflake Method for a test drive, you might do a web search for Snowflake documents. You'll likely find a number of spreadsheets and word processing document files that ask all the same questions that Snowflake Pro does. Those tools won't include Ingermanson's audio discussions, lecture notes, etc. They probably won't come with support. And you might have to adjust them to work with your word processor or screen size. But they won't cost you $50. If you try those and like them, you might want to get Snowflake Pro to have the advantage of a tool supported by the creator of the method. If you try some of those freebies and don't see the value in them, or you read Ingermanson's book and decide it's rubbish, save your money. As for me, I'm giving it a shot. I've written six novels now, but I've never brainstormed one from a single-sentence description up to a full synopsis. It seems like a complementary approach to things that have worked for me in the past. I find that if I try to do a "seat of the pants" write that I go wildly off topic, forget critical events that I wanted to have happen in the story, etc. Perhaps brainstorming with this top-down approach will deliver better results. Perhaps not. I haven't had the software long, so time will tell how much I use it, how often, etc. Right now, it's one of the tools in my writing toolbox. 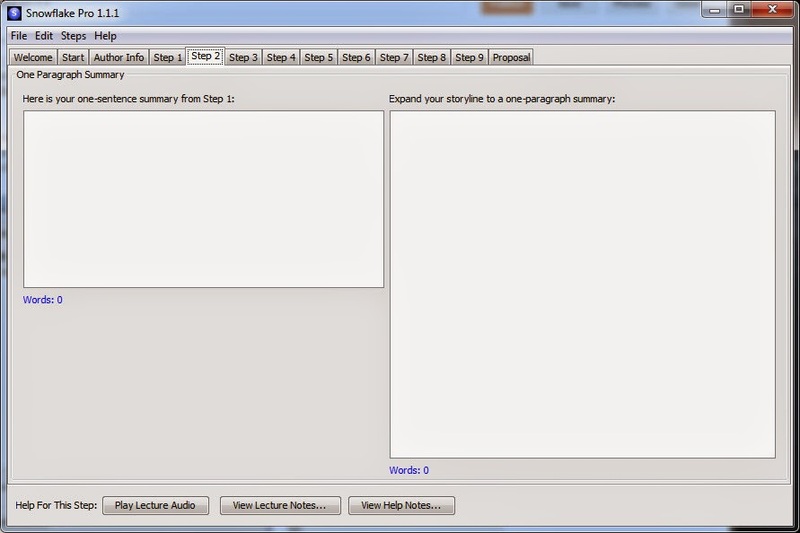 Others include Dramatica Pro 4.0, StoryCraft, Scrivener, Power Structure, and Mariner Contour. There are probably some others in there, too. We'll discuss them eventually. I will say that Snowflake Pro seems to be reliable software that does what it claims to do. I've not had it crash on me or lose anything I've written. I can't say the same for some other tools I've used over the years.